Embrace Healthcare manufactures products to assist in compliance with OSHA recommendations for fluid protection and exposure to bloodborne pathogens. We are the only company that offers non-perforated, solid side shields and our Cool Shieldz protective glasses "have no holes!" By way of clarification the final standard specifically states that... "if glasses are to be use as eye protection, they must be equipped with solid side shields." "Solid" should not be interpreted to mean opaque, but has been stipulated simply to preclude the use of mesh or perforated side shields. 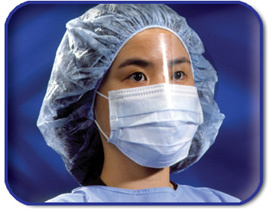 "...masks in combination with ey eprotection devices, such as goggles or glasses with solid side shields, or chin length face shields, shall be worn whenever splashes, spray, spatter or droplets of blood or other potentially infectious materials may be generated and eye, nose or mouth contamination can be anticipated."